Russ Cook is native of Mount Pleasant, Michigan. 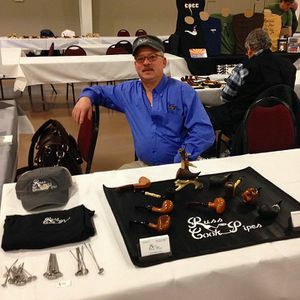 He's been making pipes on a part-time basis since 1998, and debuted his first showing at the 2003 Chicago Pipe Show; he has been attending the show ever since, and many other shows besides. One could call Russ' pipes a labor of love. He doesn't do it for notoriety or to get rich, but for the thrill of creation and the value his pipes lend to the people who smoke them. 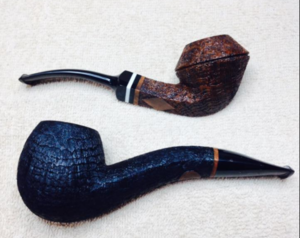 He has an eye for classical shapes, crisp lines, and pipes that serve function over form. He's very critical of his work and refuses to finish a pipe if there is a defect. 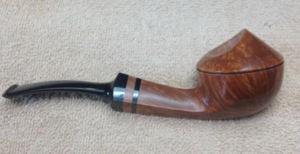 "Making a great smoking pipe takes more than just an eye for form. I use the best tooling equipment and experience to provide a quality pipe that will be cherished for a lifetime. I keep my prices affordable so they won't break the bank for your average pipe smoker who wants a premium pipe. More than just selling pipes through my online store, I go to many pipe shows every year. I really enjoy talking with past customers, fans of my work, and the friends I've made over the years at shows like Chicago, Columbus, St. Louis, Richmond, and more. If my offerings on my site or table don't impress you, I am happy to do commission work. 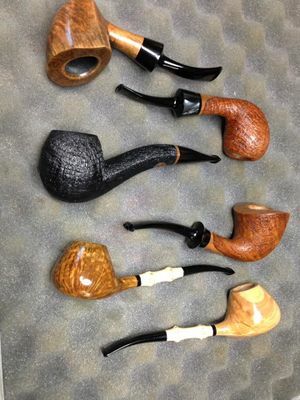 In fact, most people who buy my pipes are repeat customers, and of those repeat customers, over half of their purchases from me are commissions." This page was last edited on 27 June 2017, at 09:02.